Even aged twelve I knew a bit about the Nazi occupation of the Channel Islands - I think the Observer, which we used to read religiously on Sundays,. must have done a feature on it in the late 1970s. Even so, it was interesting then, and it is still interesting now, to read Robinson's exploration of a quaint rural isolated society under occupation by an alien force, though it is noticeable that most of the Germans are depicted as fairly humane chaps, Major Wolff having been driven out of his mind by his experiences on the Eastern Front, and only the commanding officers (and the invisible operators of Operation Todt) being real bastards. The point I missed when I was twelve is that actually Kramer's impatience with the islanders' apparent collaboration with the Germans, and his personal acts of sabotage, make him rather an anti-hero. 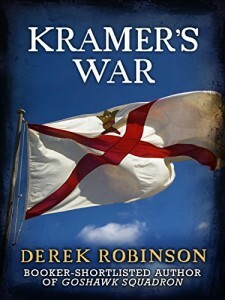 As it turns out, the leading islanders have long realised that collaborating with the Germans to turn Jersey into a massive fortress is likely to be the best thing they can do for the Allies - the more Jersey is fortified, the less likely it is to figure in a future Western Front, and the greater the diversion of resources from where they are really needed in Normandy or Brittany. This point is also made by Erwin Rommel who makes a brief appearance in the final chapters. (And of course this was borne out in real life; the French mainland near the Channel Islands was liberated in August 1944 but the islands themselves not until after VE Day in May 1945.) Reading it as an adult, Kramer comes over as a crass and insensitive Yank; the Germans get most of the funniest lines. Knowing what I do now about the all-encompassing evil of the Third Reich, it feels somewhat sanitised. It was a bit poignant to read a novel set in the Channel Islands. A schoolfriend of mine from Belfast ended up working in financial services in that part of the world, and made a real success of his career, eventually getting elected to Guernsey's Police Complaints Commission; but unfortunately died last year. So it's interesting, but also sad, to reconnect both with him and with my memories of that time of my life by reading this. I thought 'this sounds good', and lo, it's by Derek Robinson - I love his novels about First World War aviation. Oddly, not available for sale in Canada?